Outdated genome-sequencing machines need not die — researchers can repurpose them to drive next-generation biochemistry studies. In a basement storeroom at Stanford University in California, the guts of a dozen DNA sequencers lie exposed — hundreds of thousands of dollars worth of cameras and lasers, optics and fluid controllers, all scavenged from a late-model, next-generation Illumina DNA sequencer called GAIIx. On the floor, the shell of one old instrument sits empty, picked over like a carcass. “I seem like a hoarder,” says Stanford biophysicist William Greenleaf. But over the past 6 years, this collection has fuelled an effort that has engaged about half of Greenleaf’s 18-member lab team. Whereas most researchers use DNA sequencers to, well, sequence DNA, Greenleaf’s team is one of a small number that has repurposed the devices for an entirely different goal: to study protein and nucleic-acid biochemistry on a massive scale, from macromolecular interactions and RNA folding to enzyme function. “It’s a revolutionary technology,” says Stanford biochemist Dan Herschlag, who uses it to study interactions between RNAs and other molecules. It provides “deep and broad quantitative information”, he says, “that allows researchers to build more-precise biophysical and cellular models for molecular interactions, and which is also a critical step towards a truly predictive understanding of biological systems”. Broadly, the work demonstrates what’s possible when scientists look into the guts of their hardware — proof that equipment isn’t necessarily without value just because it is old or outdated. But there’s a reason such technology development is called bleeding edge: things often go wrong. Sarah Denny, a biophysicist who graduated from Greenleaf’s lab this year, chuckles when asked whether her equipment offers ‘plug-and-play’ simplicity. “Many times when you did an experiment, something would break and you’d have to figure out how to get it to work again,” she says. But given the volume of data she could extract, the reward was worth the pain. In Denny’s case, her team gained a better understanding of RNA folding. Such is life in the do-it-yourself trenches. When the GAIIx dropped in 2008, it was a hot commodity. Some sequencing centres had dozens of instruments, costing about US$600,000 apiece; in 1 week, a machine could push out 30 billion of the lettered bases that make up DNA. But by 2011, when Greenleaf established his lab at Stanford, the industry had migrated to faster hardware — such as the Illumina HiSeq 2000 — that was more efficient and user friendly, and people were giving their old machines away. “They’re basically big paperweights,” says Greenleaf. Illumina sequencers automate a sequencing-by-synthesis process. A DNA library is randomly arrayed on a device called a flow cell, and amplified in place to create small clusters of about 1,000 molecules, each representing a single fragment of genetic information. The building blocks of DNA, or nucleotides, are then transferred onto a chip, each containing a unique fluorescent signature and a reversible chemical modification. This process ensures that only a single nucleotide can be added at each cluster. The sequencer then images the array, and on the basis of the colour at each position, ‘calls’, or reads, the base that was added. The modification is then removed, and the process repeats, allowing the entire sequence to be identified base by base. At their core, these instruments are high-end microscopes coupled with liquid handlers that help to move reagents around. Some of their components — particularly cameras, lasers and movable stages — can cost tens of thousands of dollars. In 2009, Christopher Burge, an RNA biologist at the Massachusetts Institute of Technology in Cambridge, realized that it might be possible to repurpose that hardware to do something else. That, he says, is because the GAIIx was an ‘open system’, controlled using editable configuration files called recipes and loaded up with reagents that could be changed simply by substituting one tube for another. On the inside, the machine was equally open, with off-the-shelf, third-party components held together with cable ties. “In retrospect, it looks like a high-school science project,” says Gary Schroth, a biochemist who directs the genomics-application group at Illumina in San Diego, California, and who collaborated with Burge on his early studies. New Illumina instruments, by contrast, are more polished, with custom hardware, hardwired control software and barcoded reagents — features that improve the user experience but preclude hacking. Jacob Tome helped to hack a GAIIx as a graduate student in the lab of molecular biologist John Lis at Cornell University in Ithaca, New York. He recalls “a lot of panicked phone calls” with Illumina representatives, trying to work out the intricacies of the company’s instrument-control software. “There’s no manual to reprogram the instrument,” he says, so working out the logic was largely trial and error. “One of the most exciting weeks of my PhD was when we just kind of sat there at the sequencer, and we’d write a recipe and then watch the temperature go up and watch what solution it was pumping,” Tome says. Burge, however, had help. Working with Schroth, his team modified the GAIIx recipes to accept new reagents, introduce pauses, adjust the running temperature and alter the imaging parameters. The researchers then applied that modified system to conduct a comprehensive study1 of the sequencing preferences of a DNA-binding protein in yeast called Gcn4p. “We showed for the first time that you could turn a sequencer into a biophysical instrument to measure protein–DNA interactions at very high throughput,” Burge says. To do that, Burge’s team treated the flow cell — which is usually discarded after sequencing — to regenerate double-stranded DNA at each cluster. They then introduced fluorescently tagged Gcn4p protein to the chip at progressively higher concentrations, and used modified software to trick the sequencer into imaging the flow cell as if it had just completed another round of sequencing chemistry. By downloading and processing the final images, rather than the base calls the instrument typically outputs, the team could measure how much Gcn4p was bound at each place. From that, the group could deduce its affinity for every sequence on the chip — some 440 million measurements in all. “That was a really beautiful, elegant experiment,” says Greenleaf. It showed that the GAIIx platform had the potential to provide “all the sorts of measurements I was excited about: kinetic measurements, on-rates and off-rates and equilibrium constants, all the physical measurements that one might need to understand from first principles how DNA–protein interactions work”. Several researchers have used similar hacks to address questions of their own. At the Massachusetts Institute of Technology, for instance, RNA biologist David Bartel looked at messenger RNA (mRNA), the RNA copy of a gene that is used to produce proteins. His team found a link2 between the number of ‘A’ bases strung at the end of an mRNA molecule — a feature known as a polyadenylated tail — and how efficiently proteins are produced from genes in animal development. Ilya Finkelstein, a biophysicist at the University of Texas at Austin, hacked a sequencer flow cell to investigate3 the DNA-binding preferences of a protein called Cascade, used in one version of the gene-editing technique CRISPR–Cas. And some members of Greenleaf’s team worked with CRISPR pioneer Jennifer Doudna at the University of California, Berkeley, to study4 why Cas9 — the most commonly used enzyme in CRISPR — sometimes cuts at the wrong place in the DNA. Researchers have also worked out methods for transcribing on-chip DNA to create ultra-high-throughput RNA arrays — an approach that could be used to study RNA–protein interactions or to screen libraries of folded RNA molecules called aptamers. The challenge of making such an array is capturing the transcribed RNA. Lis5 and Greenleaf6 independently introduced a physical block at the end of double-stranded DNA molecules, stalling RNA polymerase — the enzyme that creates the mRNA molecule — with its dangling transcript. At Weill Cornell Medical College in New York City, RNA biologist Samie Jaffrey’s team — led by chemical biologist Nina Svensen, then a postdoc in the lab — used7 a special, viral RNA polymerase to chemically link the newly synthesized RNA to the chip, and then added a nuclease to degrade the template DNA. For Stanford biophysicist Rhiju Das, such RNA arrays have served as platforms for identifying molecules that can diagnose active tuberculosis. The project began when a colleague discovered8 a signature of three RNAs that can distinguish between dormant and active tuberculosis. The challenge was to pinpoint a single molecule — a ‘riboswitch’ — that could actually identify which state the disease was in. Such a diagnostic molecule would have to be able to bind all three RNAs, plus a fluorescent reporter, and change shape depending on which ones were present. “It’s totally bananas, obviously,” Das says. And that includes the OpenTB Challenge. Over 3 rounds of game play, Das’s team has tested nearly 27,000 riboswitches from 187 players, identifying several that seem to fit the bill. One, submitted by a retired engineer in Falmouth, Massachusetts, looks like the floor plan of a castle in one state, and like an anchor in the other. Now, with funding from the Bill & Melinda Gates Foundation, Das plans to begin testing some of these designs for use as a pregnancy-test-like diagnostic for tuberculosis. Meanwhile, a few scientists have taken the next logical step, translating on-chip RNAs into protein. In 2016, Svensen showed7 she could synthesize short protein sequences called peptides on the array, by exploiting the antibiotic puromycin to tether the peptide to the surface. And in June this year, Greenleaf-lab postdoc Curtis Layton reported9 developing an assay called Protein display on a Massively Parallel Array to profile 156,140 variants of an enzyme called SNAP-tag. He wanted to learn the subtle rules that relate amino-acid sequences to protein function. “It’s been so exciting to see just a whole new scale of protein functional analysis that we’re able to do on these machines,” he says. Exciting, but not easy: Layton spent four or five years developing his method and hardware. Svensen spent two years developing her method, which Jaffrey’s lab is now applying to create a whole-human-proteome chip. “To buy a sequencing kit for the GAII back then was $5,000. You can’t really make many rounds of optimization if you have to spend that for every experiment you do,” she says. As a result, Svensen, now at the Wellcome Centre for Anti-Infectives Research at the University of Dundee, UK, did much of her testing on microscope slides, or by using discarded flow cells from her department’s core facility. Ultimately, the team decided the approach was unsustainable. For one thing, says Layton, unlike modern sequencers with their push-button interfaces, the GAIIx was less Millennium Falcon and more “like flying an Apollo spacecraft”. Newer sequencers are also faster, and produce longer reads. Plus, Illumina announced in 2015 that it would be ‘end-of-life-ing’ the GAIIx, meaning that flow cells, reagents and parts would no longer be available as of July 2017. 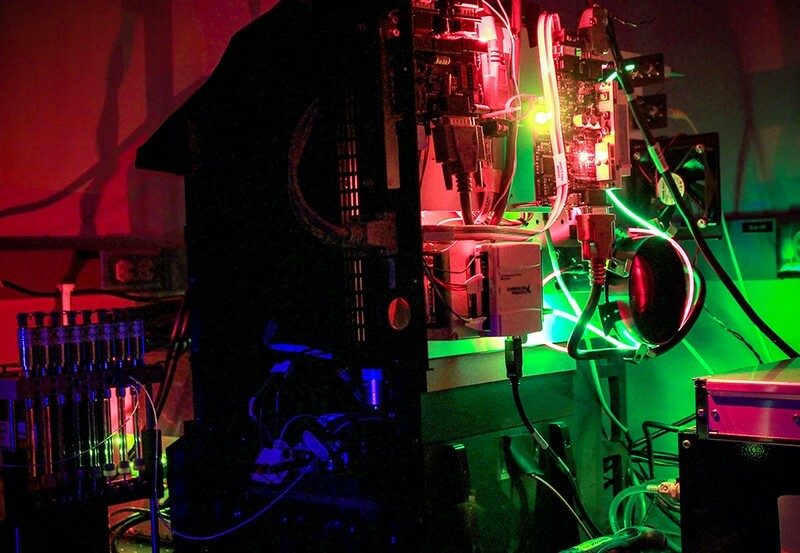 The team extracted the system’s optics, stage, camera, pumping system and lasers; supplemented the sequencer’s built-in illumination system — which lights up the sample at an acute angle from below — with downward-facing widefield illumination; designed a new printed circuit board to operate the lasers; cobbled an autosampler out of GAIIx parts to automate reagent addition; and added an on-board temperature controller. But wouldn’t it have been easier to just buy a microscope instead? According to Greenleaf, that wasn’t really an option — or at least, not an affordable one. “There’s really nothing out there,” he says, “nothing that will do the sorts of things that we want to do.” A custom instrument, he estimates, would probably have cost hundreds of thousands of dollars. Sticking with the tradition of naming instruments after fictional starships, Das christened his instrument Red Dwarf, after the British science-fiction series; this team then added a sister ship, Nostromo (Alien). Other Greenleaf imagers include Heart of Gold (The Hitchhiker’s Guide to the Galaxy), Borg Cube (Star Trek: The Next Generation) and Serenity (Firefly). “If you’ve built an instrument, you will get the glory of the name,” Greenleaf says. His lab actually has a dozen sequencers in various states of disassembly throughout the building, most of them acquired for the cost of shipping. If things go according to plan, that fleet will become ever more integral to Greenleaf’s work. His lab is perhaps most famous for developing ATAC-seq10, a method for assessing how accessible chromatin is to the proteins that bind it, and half the lab is dedicated to that work. Now, Greenleaf hopes to merge the teams, using his hacked sequencers to build mathematical models that accurately reflect macromolecular interactions in the cell itself. Correction 05 September 2018: The referencing was incorrect in an earlier version of this article. This has now been corrected. Nutiu, R. et al. Nature Biotechnol. 29, 659–664 (2011). 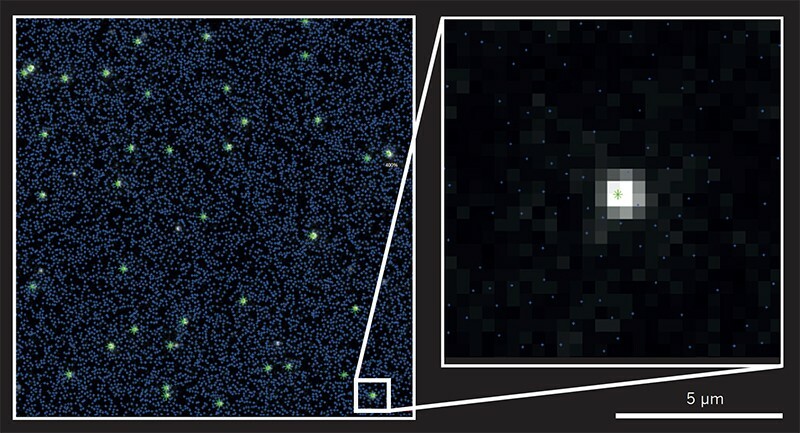 Subtelny, A. O., Eichhorn, S. W., Chen, G. R., Sive, H. & Bartel, D. P. Nature 508, 66–71 (2014). Jung, C. et al. Cell 170, 35–47 (2017). Boyle, E. A. et al. Proc. Natl Acad. Sci. USA 114, 5461–5466 (2017). Tome, J. M. et al. Nature Meth. 11, 683–688 (2014). Buenrostro, J. et al. Nature Biotechnol. 32, 562–568 (2014). Svensen, N., Peersen, O. B. & Jaffrey, S. R. ChemBioChem 17, 1628–1635 (2016). Sweeney, T. E., Braviak, L., Tato, C. M. & Khatri, P. Lancet Respir. Med. 4, 213–224 (2016). Layton, C. J., McMahon, P. L. & Greenleaf, W. J. Preprint at bioRxiv https://doi.org/10.1101/342808 (2018). Buenrostro, J. D., Giresi, P. G., Zaba, L.C., Chang H. Y. & Greenleaf, W. J. Nature Meth. 10, 1213–1218 (2013).